Amazon CEO Jeff Bezos is publicly accusing the owner of the National Enquirer of “extortion and blackmail,” weeks after the paper revealed details about his extramarital affair. Bezos had recently hired a private investigator to determine how the tabloid newspaper obtained private text messages between him and his lover, and whether the paper’s actions were politically motivated. Amazon CEO Jeff Bezos is publicly accusing the owner of the National Enquirer of “extortion and blackmail,” weeks after the paper revealed details about his extramarital affair. Bezos had recently hired a private investigator to determine how the tabloid newspaper obtained private text messages between him and his lover, and whether the paper’s actions were politically motivated. The National Enquirer’s parent company, American Media, Inc., responded to Bezos’s investigation by threatening to publish revealing photos of Bezos if he did not agree to publicly state that the Enquirer’s coverage was not politically motivated or influenced by political forces. 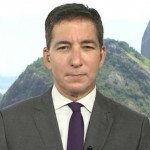 Pulitzer Prize-winning journalist Glenn Greenwald speaks about the dispute and Amazon’s role in building the surveillance state. On Friday, an operation by Brazilian military police in Rio de Janeiro left at least 13 people dead after a shootout in the neighborhood of Santa Teresa. Police say they were there to investigate suspected drug traffickers but encountered gunfire when they entered the area. Last month, Rio’s new governor, Wilson Witzel, said that city security forces were authorized to shoot to kill suspects. He also said Rio should have its own Guantánamo Bay to house criminals, whom he labeled “terrorists.” Brazil’s new president, Jair Bolsonaro, has vowed to intensify the war on drugs. While running for president, Bolsonaro said a “good criminal is a dead criminal.” In other news from Brazil, Brazil’s first elected openly gay federal lawmaker, Jean Wyllys, recently left his post and fled Brazil, amid growing homophobic violence coinciding with the rise of Bolsonaro. He was replaced in Brazil’s Congress by David Miranda, a Rio city council member and husband of guest Glenn Greenwald.